Token's low value 4 lead kelvin current sensing (LPS) resistors family offers a variety of possibilities for current shunts. The (LPS) family for shunt is expected to gain wide acceptance in the worldwide market as a result of offering a variety of possibilities. The U-shaped semi-customized LPS family for direct board mounting is specified for precision current sensing, feedback, current detective, supper low inductance, as well as surge and pulse applications. LPS family Available in very low ohm (0.002Ω~ 0.05Ω) and high power (1W ~ 5W). The dimensions of the semi-customized final unit is designed in accordance with the applicational requirements of resistance value and required power rating. 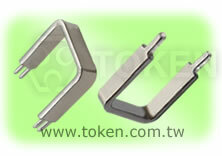 Token's LPS series can be manufactured with 2 or 4 soldertags (terminals). The LPS type B with 2 soldertags (1 pin on each side) is a standard part of LPS series and type A with 4 terminals (2 pin on each side) is used either for Kelvin connections or for high current applications. Depending from the alloy material's thickness, one terminal contact on each side can carry up to 50A (A (Current) = (W (Power)/Ω (Resistance))1/2), so a 4-terminal part can carry 100A (ask Token factory). Operating temperature range is -50°C to 300°C with tolerances ±2%, ±5%, and ±10%. 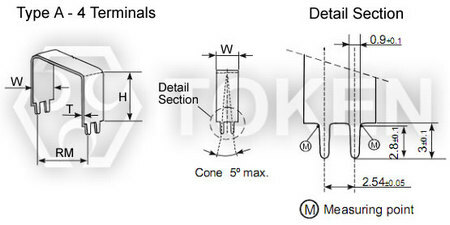 Token will also produce low value current sense resistor LPS series outside these specifications to meet customer requirements. Contact us with your specific needs. Download PDF Specification Kelvin Current Sense Low Value Resistors (LPS). ±2%, ±5%, ±10% standard tolerance. High stability bare metal element open air resistor. RoHS compliant and Pb-free. Solderable Copper Leads. CPU Drive Control, Power Tool Motor controls, Current Detective. Feedback System, Residual Battery Power Detection. High power AC/DC detection. Type Power (Watts) Resistance Range (Ω) RM (mm) H (mm) Max. W, T and H depend on material, resistance value and required power rating. RM: 5~30 mm, preferably in 5 mm-steps, Special varieties on request. Resistance to soldering heat (350°C, 3.5s) ΔR≤±0.5%R typ.